SaraPath Diagnostics® offers full service diagnostic evaluation of blood, bone marrow, lymph nodes and other hematopoietic and lymphoid tissues. Our goal is to provide timely, appropriate, accurate and cost-effective evaluation of each specimen, integrating the various results obtained into a single diagnosis. Specialty-trained hematopathologists provide continuous consultation services and are available to discuss cases directly with clinicians. Rapid results are provided for immunohistochemical stains, flow cytometry, cytogenetic analyses and other molecular testing. Hematopathology services are available Monday through Friday, including Friday evening, with STAT cases reportable Saturday morning at the ordering physician’s request. SaraPath Diagnostics® integrates all pathology, flow cytometry and cytogenetic studies into a useful diagnosis tool for the clinician. SaraPath ensures ready accessibility of its hematopathologists for pre or post-analytical consultation with clinicians. SaraPath pathologists are an important part of your oncology team to ensure definitive diagnosis and optimal case management for each patient. 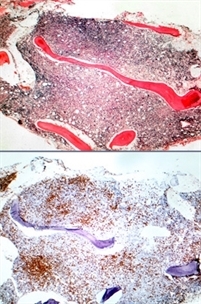 SaraPath pathologists refer the majority of bone marrow specimens (depending on the clinical indications) for cytogenetic analysis, incorporating the results, provided by PhD cytogeneticists, into the comprehensive pathology report. Definitive diagnosis backed by experienced hematopathologists, cutting-edge technology and thoughtful judgment. Experienced, specialty-trained hematopathologists available around-the-clock to support the ordering physician. Appropriate and thoughtful ordering of tests, working in concert with ordering oncologists and hematologists. Consolidated reports that combine all studies into a single, easy-to-read document with digital images. Fast turn-around time, with many non-complex hematopathology reports available within one day of specimen receipt. Most up-to-date CAP and AJCC cancer staging guidelines used, to provide definitive diagnoses and clear, concise reporting. Insurance contracts with all major providers, enabling SaraPath clients to consolidate AP testing and streamline ordering practices. CAP accredited laboratory, proud of its multi-year deficiency-free inspections that support quality patient care. Organization-wide service culture to meet and exceed the expectations of valued clients. Highly trusted, physician-owned anatomic pathology laboratory that has been delivering reliable, responsive, and individualized AP testing services for physicians since 1975.